Home to a vast array of aquatic mammals and animals, at the Vancouver Aquarium Marine Science Centre you'll find sea otters, penguins, dolphins, sharks, whales, sea lions and many more exciting creatures. 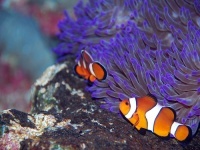 Exhibits, displays and programmes are geared towards kids, including Clownfish Cove, with small animals, play areas, and costumes aimed at teaching children about the natural world and the importance of marine conservation. The aquarium features a gift shop, cafeteria, and wheelchair access. Visitors of all ages should enjoy a trip to this well-organised and large aquarium, which consistently receives rave reviews from travellers.